What I’m about to share is going to be more popular than guest posting or utilising private blog networks to improve search engine rankings in 2018. It’s not a tactic I created myself. Nor is it one I’ve only just discovered. I’ve followed its increasing usage throughout 2017, and now it’s finally time to write about it. While there are certainly ways to employ the tactic legitimately, you can probably guess from my headline that it’s being used in ways I can only describe as unethical. And it’s working incredibly well. The reason I didn’t cover this sooner is because I fear that shining attention on the ways it’s being used will increase its popularity. I’ve been involved in SEO for 12 years now, and in that time I’ve seen countless link building tactics go from a point where they’re used with good intentions – such as guest posting on a site because you really want to serve their audience – to being utilised purely for self-gain, like sending thousands of bloggers generic articles to publish (with your links embedded). What I’m about to share has already moved over from honest to unethical (from whitehat to greyhat, in SEO speak), and automation is undoubtedly just around the corner. I’m writing this article to help people understand why they’re now receiving emails full of praise, more interview requests than ever before, and congratulations for winning awards, rather than asking them to publish pre-written content. This tactic is still on the sidelines for now, enough so that even seasoned SEO’s won’t have seen it in action. As sites just a few months old are using it to get mentioned by big brands, I can only expect its usage to greatly increase. The kind of sites webmasters could only dream of getting links from are now giving them out with relative ease, and there are millions of potential targets ready to do the same. If I were selling an SEO product with these claims, I would be called a fraud. I have nothing to sell, other than a warning for what is about to come, and a personal plea to Google to curb this before it really takes off. Sites I’ve found that are suddenly dominating Google right now are following a very simple tactic: They write articles full of praise about other businesses – mentioning them with links that don’t give ‘credit’ – so that those businesses reciprocate with links that do give credit in the eyes of search engines. If you’ve just been waiting for the ‘secret’ so you can skim the rest of this post, there it is in bold. If you’re involved in the marketing or promotion of websites in any way, I hope that you take the time to read this, because you or your clients could be on the receiving end of what I dub #fakelinks very soon. The websites I’ve found tend to write over-the-top, positive reviews about companies which are often unrelated to the business they’re in. The targets of this strategy are websites which maintain active “In the press” or “Media” pages. As there are millions of websites which fit this description, opportunists have a large market to penetrate. Before I go into detail on how the naïvety of others is being abused to improve search engine rankings, I want to start with a typical example of how media and press pages currently work. CryptoniteNXT – who I have no affiliation with – are a new startup in the world of cyber defense, specifically helping companies fight against insider threats and ‘ransomware’. Because of the interesting work they’re doing, news websites frequently write about them. You can see an example of this from a recent story on DCInno, the Washington, D.C. arm of AmericanInno. A company from the state they cover are doing something interesting, so they feature them. Any time someone writes about CryptoniteNxt they update their media page and link back to the news, as shown below. Being a cyber defense firm, they aren’t expecting to go viral on social media or get noticed for their clever Facebook ads. Instead, they want to be talked about by relevant websites who document their story and progress. Millions of businesses around the world monitor the press they receive and cover it on their site. What’s increasingly starting to happen is websites which would typically never write profiles on other companies – such as those which sell their own anti-virus software, for example – are now singing the praises of others, all in the name of links. So why write an article about this? One company gets free press, and the other gets their coverage linked to. If you’ve been involved in SEO for a while, you’ve probably figured out that the parties who have learned how to pick up these ‘in the press’ links aren’t doing so with the best of intentions. I’ve personally found hundreds of webmasters writing about companies while linking to them with nofollowed or redirected links (such as oursite.com/go/anothersite.com). In other words, I could write a glowing review about IBM on my gadget site and put it on an area of my website which no human will likely ever find – or mention them via a nofollowed link – and then reach out to IBM to let them known about the review. I give IBM a link which essentially has no value and in return, IBM give me a link on their press page which helps catapult my rankings higher in search results. IBM may sound like a far-fetched example, but this is the kind of huge company that are “falling” for this tactic right now. “They approached us to write an interview about our company’s history and we agreed” said the support staff of one software company who have found themselves the target of such an approach. Their homepage is frequently updated to link to the latest news that features them. Getting a homepage link from an official business website, which itself has lots of links pointing to it, is the dream of website owners who rely on search traffic. “I’ve been subjected to one of those myself; great piece of ego-bait” recalls Barry Adams, founder of SEO agency Polemic Digital. In some scenarios I’ve came across, brands with multiple websites have each written a positive review about the same company; all receiving a link from the same press page of a brand you’d be familiar with. “To confirm – in a strictly technical sense, the links are indeed blocked from Google seeing them. I just ran a crawl on one of the pages; the link does not get picked up” says Dan Shure, the founder of Evolving SEO, after sharing one such scenario with him in private. Why websites link out with nofollowed or redirected links likely stems back to the concept of sculpting PageRank, a metric Google use – in its most basic form – to determine the worth of a website, and thus help to position it accurately in search results. PageRank was developed by Google founders Larry Page and Sergey Brin in 1996. It’s a complex topic, but those taking part in sculpting it likely believe their site retains a higher ‘value’ if they don’t link out, or they simply wish to avoid the appearance of being involved in link exchanges. The latter is something Google have warned against since 2011 in their link schemes documentation. Without working for Google, and even then having intimate access to their algorithm, it’s impossible to say whether the tactic makes sense, but few webmasters would turn down followed links from a brand like IBM. I’ve decided not to give any specific examples as I fear – as often seems to be the case – that Google would simply target individual webmasters on new sites and allow established brands to benefit from doing the same thing. While I don’t agree with what people are doing, I can’t deny it’s smart, and highlighting one or two examples isn’t going to curb what’s happening. If you’re a fellow marketer and would like to verify my claims so I don’t have to ‘out’ anybody, an example search query you can start with is “Inurl:in-the-press” (without the quotes). You can also try changing the timeframe of results (Tools > Past Week) to only return such pages which are actively updated. Start going through the results and you’ll find the same companies being targeted over and over again, giving out links that aren’t reciprocated in the press they receive. Note: To further protect those who I don’t agree with but don’t feel I should target, that example query is not one I used to find my own instances of this happening, but it’s a good starting point. The example I’m about to share with you is not something I believe happened unnaturally so there should be no harm in covering it. Brideside, an eCommerce store primarily selling bride and bridesmaid dresses, has been mentioned in Racked, Town & Country Magazine, The Huffington Post and other places you would likely recognise. As you would expect, they’ve proudly added these links to their In The Press page, shown below. There are currently 15 links to other websites on this page. Here’s how those other websites cover them. Out of the 15 different sources they link to, only 7 of them actually link back with a followed link. I don’t think these companies specifically reached out to Brideside saying, “Hey, we mentioned you, can we get a link please?”, hence my willingness to share it here. That said, it’s not hard to find groups of similar sites targeting the same press pages over and over again to pick up easy links. The interview angle that’s increasingly popular is smart, if not incredibly sneaky, because it gives you a much higher chance of receiving a link from whoever you interview. Instead of just writing good things about a company and hoping they’ll feature you, if they’ve already taken the time to answer your questions, they’re invested, and as such pose a bigger likelihood in linking to said interview. Of course, these aren’t normal interviews, and in my opinion they’re not being done for the right reasons, though not everyone shares my concern. “I think that this is a fantastic link building strategy” stated Marie Haynes, of Marie Haynes Consulting. Wherever this tactic currently lies on your moral compass, I hope you’re starting to get a sense of how prevalent I think it’s about to become. I could have called this tactic #fakepress and it would have likely made for an interesting story, but this isn’t just about picking up links by covering companies and not giving them links in return. It’s about not giving links out at all, but happily dominating search results and benefiting from all of the people who link to you. 12 years since I got into search, links from one site to another are still Google’s best way of figuring out where one site deserves to rank in their search results. Just like Google’s algorithm resulted in webmasters using dashes in URL’s rather than underscores, I argue it’s unfairly benefiting large websites who don’t want to give any ‘link credit’ to other sites, but will happily receive it. I can’t be too harsh on Google here – some changes, like encouraging webmasters to adopt HTTPS, have no doubt made the web a better place – but without action they’re opening the door for this tactic to prevail. Shopify, the software platform that powers over 500,000 eCommerce stores, succeeds when their customers succeed. The longer someone keeps their store online – likely because they’re making sales – the more money Shopify makes from their monthly subscription fee. While store owners on their platform generate revenue thanks to traffic from sources like Facebook, Twitter and Pinterest, search is undoubtedly a huge part of the sales strategy for many sites on the platform. Though there are said to be well over 200 Google ranking factors, it’s generally agreed by SEO experts that links from one site to another are paramount in improving a sites standing in search results. “When Google sees the attribute (rel=”nofollow”) on hyperlinks, those links won’t get any credit when we rank websites in our search results” stated the Official Google Blog in 2005 when nofollow was first introduced. That’s why it would be strange, when so many of Shopify’s customers need links without this attribute to rank, that Shopify.com would only link out to other websites using this attribute. It would be the ultimate irony, but it’s exactly what’s happening. At this moment of writing, Shopify feature three customer success stories on their homepage. 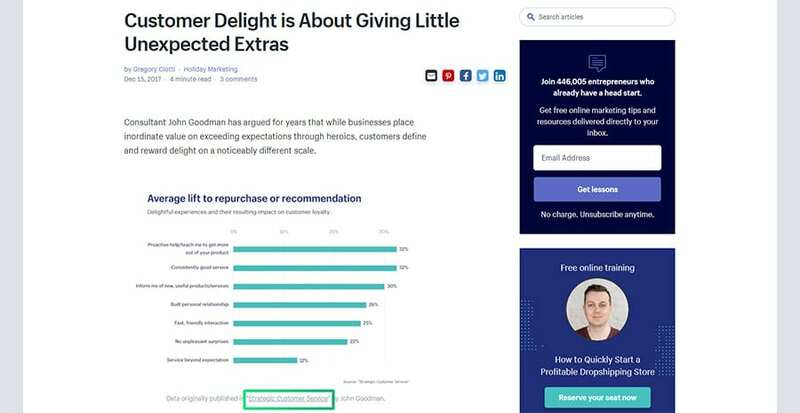 So that I’m being objective – and not trying to show you data from their customers who rely on search for almost all traffic – let’s look at the stats for the customers they highlight. I’m willing to bet that if we looked at every single Shopify store that has made at least one sale, over 50% of their averaged traffic would be from search. Shopify and their customers benefit massively from people talking about them and linking to them. Shopify themselves don’t think they should give credit to anyone they link out to. Here’s the second most recent post on the Shopify blog at this moment of writing. Click here to view a slightly larger version. That green box encloses a link to Salesforce.com with the nofollow attribute, just like every other external link on the Shopify blog. Correction: The link below that, rather than the one highlighted, takes you to the Salesforce blog. The chart itself was created uniquely by the author, based on data from a book referenced in the highlighted link. I’ll play devil’s advocate for a second and say that Shopify don’t know who is contributing to their blog so they just do this to be safe. I can only play it for a second. Shopify made $590m in 2017. It’s hard to believe they can’t hire one person to make sure their outside contributors aren’t selling links to people who want to get mentioned on the site. If they can’t hire someone to vet contributors for their official blog, then don’t have contributors. You may think I’m getting carried away here, but consider the following for a second. If every site who linked to Shopify customers also used the nofollow attribute, they would potentially lose up to 50% of their revenue next year. If Shopify don’t want to give out ‘link juice’, why should they benefit from people who do? Shopify are far from alone in no-following every outbound link on their site. Entrepreneur.com, Inc.com, Forbes.com, The Huffington Post (sorry, no links) and many others have gotten in on the game as well. Not one of these sites has been treated like links pointing to them are all nofollowed. I argue they should be. Unpopular opinion: Sites that nofollow every outbound link (Forbes, Entrepreneur, Huffington Post contributors, etc.) don't deserve to rank in Google. If you can't monitor the people writing for your site, don't have them in the first place. Judging from the number of likes and retweets I received, it seems my unpopular opinion isn’t so unpopular. Am I just a webmaster whining about how I can no longer get a link from Shopify.com that could help increase the ‘value’ of my site in the eyes of Google? I can’t deny it would be nice, but no, not at all. In 2017, every webmaster I know faced an absolute barrage of emails in their inbox from people looking to guest post on their site (without stating they accept guest posts, and most commonly when they don’t accept them). For many like myself, it has made our inboxes a bit of a nightmare. I receive up to three requests per day from people looking to guest post on my website. 99% of topics they suggest have nothing to do with marketing, which is what the site they offer to guest post covers. Here’s an example from last month. This is not a carefully selected example to make a point. Almost every request I receive is as unrelated to the content I write as this one. 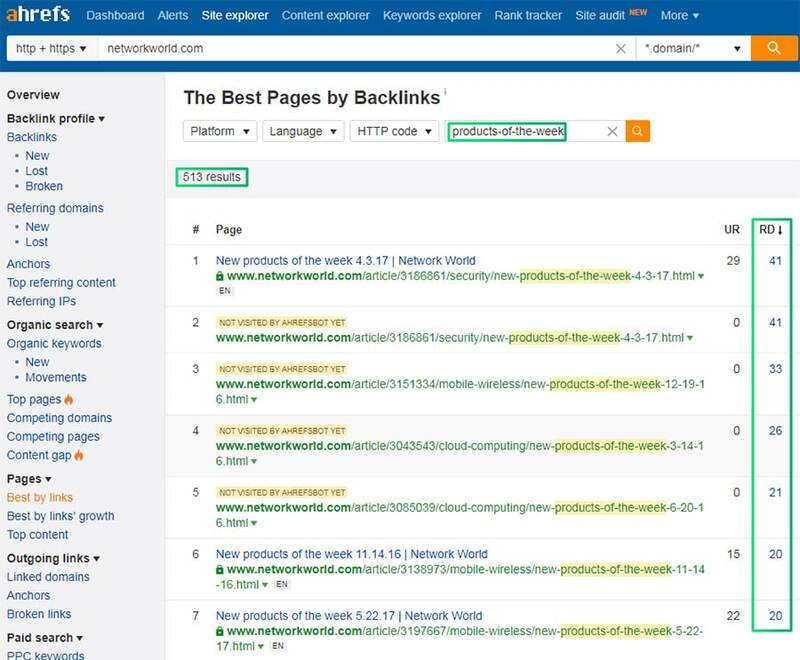 If something works when it comes to picking up links that help you rank, webmasters will take advantage of it. If Google continue to reward websites which nofollow every single outbound link, the amount of requests for interviews and press mentions – where you only get #fakelinks in return – are going to increase tenfold. If you’re a fellow blogger and thought guest posting outreach was bad, 2018 has another surprise for you. Countless businesses are going to find themselves linking out to positive press which was only written for them to link out to. Countless more will spend hours answering interviews that nobody will ever see, just so they can be asked to talk about those interviews once they’re live. This will undoubtedly make the situation where just 16 companies are dominating the world’s search results far worse. Big brands will continue to pick up links because they’re already established, while fewer opportunities will exist to pick up links from big brands. Popular IT brand Network World, owned by the billion-dollar media company IDG, are involved in some of the smartest link building of this nature. Each week they feature the best new products in their space. And every single time, the people they feature link back to them. As you can probably guess, every link Network World give out on their 30 picture slideshows are nofollowed. They have over 513 of these weekly pages which pick up links every time they’re published. For those unfamiliar with the Ahrefs platform, RD in the screenshot below stands for ‘Referring Domains’ which is essentially the number of unique websites which link to that page. Because Network World are a big brand, businesses are proud to share the coverage they receive. Often the links they receive in return are the absolute best you can get: Homepage links from the official site of real brands. For the sake of argument, let’s just say Network World have been doing this forever and have no idea it’s helping them pick up so many new links each week. Why would a roundup of editorially chosen “intriguing new products” be websites they couldn’t vouch for? Why do those links have to be nofollowed? It makes no sense. Sadly, it’s a trend that’s only increasing. SimilarWeb estimates that Business.com receives 70% of their traffic from search, meaning it’s incredibly valuable to them. Like many other entrepreneurial-focused brands before them such as Inc.com and Forbes.com, they nofollowed all outbound links towards the end of 2015. Their traffic doesn’t seem to have faltered because of it though. Here’s how their search traffic numbers are doing right now. Even if they reach out to someone to interview them for a story, they nofollow the link back to that person’s personal website or business. Like Bloomberg, USAToday use sources hundreds of times per day to add content to their stories. And like Bloomberg again, they also add the nofollow attribute to those links. As you can tell with the theme of my story here, that certainly hasn’t hurt them. The strange thing, or not so strange anymore, is that they write entire articles about other businesses and still keep the attribute in place. Ranking number one in Google for ‘best construction blogs’ and other related terms, you would think that About.com’s latest brand, The Balance, would give a little love to the winners of awards they created themselves. After all, they’re personally recommending you follow these sites. The second result for best construction blogs is from Capterra, which is where The Balance’s author also works. Capterra’s list of the top 23 construction sites gives out followed links, but that only earns them a second place ranking. If it’s your first time checking out the BizFluent website (no link from me) you could easily think they’re just a site put together to get traffic from Facebook. Reaching over 1.5 million visitors per month, a surprising 91% of them find the site via Google. Every single article feels like it was outsourced by someone who doesn’t really care about the topic. The last article on that list is literally 371 words long. And every site they reference picks up a nofollowed link. And every other news site that could be thought of as a competitor. While I won’t claim that their search traffic has increased because of these changes, they certainly haven’t decreased in spite of them. Unlike other sites, Newsweek didn’t nofollow all external links from the past, but are nofollowing all links going forward. Greatist is a bit like the early days of Buzzfeed in terms of content, but focused primarily on health and fitness, and with a little more legitimacy. After raising $4.5m to grow the brand back in January of 2016, their search traffic has almost doubled since then. In August of 2015, a few months before receiving the funding, every site they reference stopped receiving followed links. I could go on and on here, but hopefully you’re starting to get the idea. PCworld and MacWorld, like Network World profiled earlier, are owned by the same company, IDG. It seems like they made a company-wide decision to nofollow links from most of their network. While it’s common for sites to nofollow some links – I keep the default WordPress settings on comments here – not giving credit to any link has started to become commonplace in recent years, and people are taking advantage of that. Marketers around the world right now are taking advantage of in the media and press opportunities because they believe they work (and from my data, it certainly appears that they do). You keep the link juice of your own website, and don’t pass it around to others. This is essentially a form of pagerank sculpting, which has been written about by Google engineers as far back as 2009. If you see big names you recognise like USAToday or Business.com or Newsweek nofollowing links and having their search traffic grow like crazy (admittedly, this is more likely correlation than causation) then why would you not do the same? Why would you not nofollow every outbound link to ‘be safe’ but make sure the links you pick up don’t carry that attribute? With all I’ve said, I can’t deny there is a big potential flaw in my argument. I have to entertain the possibility that Google are already treating sites that do this in a negative manner. It’s highly unlikely (Wikipedia still ranks for everything) – especially with prominent Googlers now recommending you nofollow links to every guest author on your site – but for the sake of argument, let’s say it is the case. Google need to update their documentation. Their advice is clear: If you’re not sure about a link or don’t want to be penalised for selling links, add the nofollow attribute to those links. If the future of link building doesn’t revolve around #fakelinks, I argue Google must state – and change their algorithm to reflect – that if you don’t give credit to every outbound link on your site, it may appear unnatural and hurt your rankings in their search engine. I’ll continue to build sites that focus on search traffic whether Google make an announcement or not, but I should repeat my fear that even fewer companies will dominate search results, and even more unrelated emails will arrive in my inbox this year, looking for links to irrelevant praise. Just like they’ve denounced selling links, utilising private blog networks, guest posting, embedding widget links, link building with contests and more, I think they can stop this practice from becoming mainstream before it exits the shadows. Otherwise, here’s the future of link building in a nutshell: Websites, products and services are going to get more unnatural praise than ever before – via links which search engines either don’t credit or can’t see – all in the hope that said website, product or service will talk about the good news they’ve received. If Dale Carnegie was right, and the sweetest sound to any person is their own name, then the sweetest sound to any business online is positive press about them on another site. If nothing changes, people are going to spend time on interviews nobody ever reads, share awards that were only created for them to share, and add links from their press page to those who only wrote the praise for that to happen. The only way to stop it is if sites that nofollow every external link don’t get the credit for every link pointing to them. Without this change, expect the future of link building to consist of a lot of fake links in order to get a lot of real ones in return. Update: One hour before I went live with this article, I was able to ask Googler John Mueller what he thinks of sites which nofollow every outbound link for an upcoming webmaster hangout (live Google video chat). Around 30 minutes after this article went live, John was able to answer my question. We won’t penalize a site for nofollowing all links. They can choose what they want to do. Some might nofollow all links, others might selectively nofollow. If sneaky links show up, it’s understandable they would [be] nofollow. Google’s algos just need to deal with this. It’s not a new situation. But it definitely makes it harder for those trying to gain natural links as contributors or columnists… But, it has been used to game PageRank. Tough situation. Though I’m impressed a senior member of Google’s search team can give any kind of response, I certainly wouldn’t hold them to this quote. It was given on video, live, and answered without being able to read this article first. Still, the feedback is interesting, and perhaps shows this is already something Google are thinking about. Much appreciated, John and Glenn. Update 2: I’ve modified the article slightly to make it more concise. I think this is an important topic, but if I were to go back in time, I would have swapped the order of the nofollow and #fakelink sections. It’s unlikely I’ll revisit this subject, but wish my coverage had resulted in more discussion on what the future looks like if far more sites nofollow all external links. Would content marketing be as relevant? Which ranking signals could we look for instead of followed links? Would it make Google’s own job harder and encourage them to take action? If anyone covers such an angle, please feel free to email me or post it in the comments below, as I would love to read it. I have to say Google screwed up with this whole no follow, follow/disavow business. It was the first moment that they asked webmasters to help them work out rankings in the overall algorithm. It’s Googles job to work out its rankings, not individual webmasters. Remember the web is full of millions of amazing websites ran by people who have no knowledge of SEO nor care for it. These websites make up good proportion websites people land on. If they get their websites banned because they didn’t submit a disavow file or didn’t add nofollow to paid links on their site, Google, their users and the webmaster lose out. I’ve had a few sites that I’ve guest posted on in smaller niches all of a sudden nofollow all their outbound links. When I inquired they just said “it’s policy now.” Strange and disrespectful, but I get it. I’m off to see where else this is happening in my niche. I hear you, Brendan, it’s very irritating to me when I write a guest post and get a “nofollow” link! How disrespectful. Isn’t my time and effort worth a link? Also, when I’m interviewed by a journalist at NYTimes, or PBS, I spend valuable time helping them with the story — and we get a nofollow link in return. Really??? UGH. Now, when I write a guest post or interview for a story, the first question I ask, “will we get a “follow” link? Glen, the link-building tactics mentioned via “press” is a worthy one. However, since this is “my” responsibility at Seniorcare.com — I do all the content and write articles to gain links. The fault in your press/media tips is extremely labor intensive. In order for us to gain 1,000 links, that means I have to write 1,000 press articles on individual companies. That effort is not worth 1,000 links. Now if we could get 5,000 links to one article, I’m all over it. How do you suggest I do that with your strategy? But maybe I’m missing something? If I was immune to the potentially bad morals of this, I think the work required to pick up links is minuscule. Email a company with interview questions. Post the interview. Get them to link back to you. Doing this 1,000 times, and picking up links from 1,000 websites (unrealistic, but playing along) could help you rank well in pretty much any niche that exists, providing you’ve put even just a few days of work into keyword research. I am not advocating doing this – which is why I can’t advise how you would pick up 5,000 links to a single post – but if you don’t see the value here for how little work is involved, I probably could have written this better. I agree with Glen. It is totally feasible spitting out copies of question sets to several hundreds of companies and then massaging those who answer into actual articles. A really helpful article, again, from Glen. Remember, not all links are created equally i.e not all links carry the same weight so 100 of these links may be better than 500 of links of other types; so you may not need that volume for this to be effective. A similar result comes from monthly/yearly ranking posts like “Top 50 Businessmen of [City Name]” or “Top 50 Pizzerias in [City Name]”. This also works very well in the travel and wine industries, where press mentions are rare, but you also want to have a social media profile. So every time an obscure blog places you on the “Unknown but Great Wines from [Region]”, they include 20 companies and then hope for some shares and/or links. Not to shameless promote something, but this is exactly what we covered in the third case study in Detailed Pro. I hope you’re – ethically 😉 – taking advantage of your findings, Dumitru. Second, site with all nofollows should be immediatelly sandboxed by unnatural link profile. It simply doesnt happen naturally. Period. It is exactly the same situation as with all those regulations by govt – first one little here and one small there. Then we adjust this and that, put one more there to “balance” it and off we go – in no time there is an octopus of regulations which are absolutely unpredictable, unmanagable and in the end highly unfair. And nobody – including its own authors – understands it anymore. Has anyone studied the extent to which “no follow” impacts the quality of the link from Google’s point of view? Anecdotally, it appears that there’s still some SEO value to receiving no follow links (but that observation is, I reiterate, only anecdotal). Good question, Bryan. Not that I know of. ” it appears that there’s still some SEO value to receiving no follow links (but that observation is, I reiterate, only anecdotal).” logically I think this would still make sense, yeah. One interesting note – I have a site which has ranked for the past year based almost entirely on one dofollow link from a big authority site. A couple months back the site nofollowed all their outbound links (Urgggg!) – yet my site is still ranking the same as always…. Weird. Don’t underestimate Google’s memory (for both good and bad links)! I’d rather write better content on my blog, write for large publications, use inter linking and social media than all of the backlinking stuff. I feel that its a waste of time and the search engines are WAY to smart now. Nice article tho Glen! After spending more hours than I care to admit on this – and a year of following it – I have to strongly disagree. Search engines are definitely aren’t (currently) clued in to this happening, but the quote from John I added to the end shows it may just be the beginning. Nice post Glen. Unfortunately this is getting popular in blogging, where some bloggers with SEO knowledge take advantage of other bloggers that don’t know anything about no-follow or other similar practices. Every year they create a listing of “best psychology blogs” and then reach out to the quoted bloggers, so they get links in return. But if you have a closer look at the links on that page, they are actually linking out to the Twitter of Facebook accounts, not even the blog! And in those cases where they link to the blog, they make sure to add a no-follow attribute. Of course, their own internal links (as they list themselves as the very best psychology blog) are followed. I think Google messed up with follow/no-follow, as this kind of webmasters with poor ethical values are using it to take advantage of small bloggers and entrepreneurs. Fascinating. Of course, you realize Google is going to change nothing, yes? Not that I blame you for tryng. But, and if I’m not mistaken, you once pointed out yourself Glen, that Google runs a (I’m paraphrasing here) multi-gabillion dollar business… And you make any sort of changes to the behemoth cash cow that is Google Search/Adwords very, very slow and cautiously, if at all. how comes you dont link out to all the places you mention on detailed.com? Oh cool. I think you’re missing a few links though. There’s a lot more too! This page has a followed link to Playjudgey.com. @Glen seems like he didn’t check the link that you have added in View Case Study button (Blue button). He is referring the text where you mentioned the sites with no hyperlinks. As stated, that’s only on the homepage. I always link out, besides the case study I just started, mentioned in a comment above or below. Interesting! I also think these big players should be penalized as they are sculpting PageRank by preserving all link juice, where it should have been in a natural way. One thing worth just expounding on (which might get lost is in translation), is that when you add a no-followed link, you do still lose the page rank (one of things mentioned by Matt Cutts in the post linked). You’re not sharing it, but you are also not getting it. The benefit of no-following all your links from a page rank POV is nothing (according to theory), it shouldn’t help your traffic at all. But it’s still worth no-following all your links at the moment (particularly for large businesses), because there’s is a risk of accidentally linking out to dodgy sites and suffering for it and it also means you get less outreach spam from SEO’s. Also worth noting that most of the public information on page rank (and what people talk about in SEO), is based off the initial paper written almost 19 years ago. It’s entirely possible there are weighting factors which take into account if a site no-follows all links. Does it mean that weighting is as “correct” as if links were no-followed/followed with the original intent? Probably not, but it’s worth bearing in mind that Google has only become more of a black box and harder to read into as time has gone on. Having said that, I think the conclusion of the post is probably still correct, even if the sites aren’t total black holes, I think re-creating an honest link equity from it would be exceedingly difficult. And completely agree it would be wonderful if they didn’t just give a blanket pass to site wide no-follows even if I can see why they’d do it. Why does nofollow matter in this context? If you praise someone with or without the nofollow and they then link to your site, how much difference is there in the value of the link that you’ve earned? Are you assuming that once it becomes reciprocal that Google will completely devalue both links? You didn’t point out the sites using this method of using a followed link to earn a better followed link back and curious what your thoughts are there. I’m presuming that those who aren’t linking out assume they are keeping their own ‘value’ without giving it to others. For example, Newsweek are – in a sense – a competitor to the New York Times. For example purposes, I argue that they no longer give links to The New York Times so that The New York Times don’t benefit from their links (and therefore outrank them in Google). (I don’t expect this to be their specific reasoning; I’m just using it as an example). I believe such instances are more focused on receiving links, rather than any form of giving them out. I totally agree the benefit is in receiving versus giving them out but I’m just suggesting that if you give one to get one, do you still feel that this practice is ‘immoral’ or bad in any way if the nofollow isn’t involved? Would this still be something you think should be penalized/chastised in those instances? Well, it’s a great article and it is saying much that you are an unconventional being … I learned a lot in this post namely I can just pay for the press release, or write about others and send them my article with the hope they include my article on their site – no follow or follow I am happy to receive the link. Great article Glen, some very interesting insights here, hadn’t come across this idea yet. Agree it’s probably not a good thing for the SEO world. Great Stuff Glenn, though I must say i’m a little disapointed in you. Jokes aside – great article – I’ve been doing Ego Bating for a while with great success actually. For one of my dating advice affiliate websites, I put together a “top 10 relationship experts” post in about 1 1/2 hours, and got links or social media mentions from 6 of the 10. Anyway, great way to start off 2018 – Looking forward to what you share the rest of the year! I personally never believed that “dofollow” and “nofollow” really make any difference in terms of utilizing them for ranking sites. (talking from the receiver end) I’ve ranked sites in medium competition niche with 100% nofollow links as well. So, I don’t really care much about the attribute that link is holding but it’s relevancy. I’ll take no-follow links from business sites or other real sites all day! This is not the moral conundrum you seem to think it is. I’ll happily take them too, but that’s not the argument. Appreciate the effort you’ve put into this article. It’s always a pleasure to read your posts. I hope that Google does something about this in the future. I’m sorry but any company/business operating online who do not have the knowledge/skills/nouse to investigate if a link is no-follow or not deserve everything they get. It’s naivety of the highest level. Very interesting article. I have received many guest blogging requests last year, but as my website is still very new and not ranking yet, the practice described here most certainly is not why it happened. I am very happy to learn about this new trend though; always good to stay informed. Looking forward to future articles…. Just read about this on Brian Deans website as a recommended way of getting links yesterday. I don’t get what you said about hoarding or keeping link juice for themself? When you nofollow, you loose the “juice”…it’s like flushing it down the toilet. The reason they do that is so their is no 2-way link which would demote/lose the value of those that link back to their piece. Sneaky, but they do still “lose” link juice. A lot of editorial relies on guest posts and they are paranoid, perhaps rightly, of authors selling links. Or, the editor is too lazy to check and be sure no guest contributor is putting a spammy link on an article. Many of them nofollow everything for that simple reason. I guess maybe the end of the article touched on this but it seems like just plugging away and doing the work to get natural (and perhaps some not-so-natural) back links, even if most are nofollow, is a good insurance policy for either the day Google says nofollow is broken, and stops using it altogether, or in case Google is already starting to give some sort of SEO benefit for ALL links, including nofollow. This is a tactic that is actually very common in local seo. Companies interview local businesses and publish their stories – this effect is two-fold. One is to get them to link back the other is to understand their problems and sell them solutions. Keep up the great work bud. Very interesting – and ties in very well with your previous post of the few companies that literally dominate the internet (IDG / Hearst / et. al.). The one item that would be interesting (however hard to know for sure). For the blogs/articles that do actually rank on the big sites (top 20 construction blogs for instance) how much traffic do you think the no-follow linked blog would receive? It doesn’t help the blogs SERP rankings, but is it possible that it helps with their natural click throughs from the major site? I’m thinking of this from a blog commenting perspective where you post your link in a comment knowing you won’t get link juice, but you may actually get legitimate click throughs. Does that make sense? Thoughts? I’m not really seeing how these are Fake Links… And I believe it’s a strategy that’s been around for years. Sure, people are using it to disingenuously write glowing reviews about people/companies, but that’s why you take the time to decide whether or not you should link back to it. And if someone mentions you without linking to you, you can ask for one. Mention is a great tool for this. This whole strategy is pretty much why online case studies exist in the first place. Especially in the SEO niche. I will admit the “nofollow” stuff is annoying, and big publishers are abusing their power, but this is hardly new. That’s why I have a choice on whether I want to work with them or not. I personally don’t believe the onus is on every company to have to check this in massive detail. I imagine many (most?) don’t even know that nofollow is a ‘thing’ nevermind how to check if it’s being applied. In the introduction I did say this isn’t new. I made a prediction, wanted people to be aware of what is happening (quite a few have thanked me for this) and commented on a trend I think is increasing. I may have missed up my preferred order (made an ‘update 2’) but mostly went to plan. Either way, I really appreciate your comment! Great post! Happy to see more articles on Gaps. I might try this tactic for the crypto niche. Houzz was built on a similar method. They allowed designers to post their portfolios on the site and in return said ~”we’ll only feature you at the top of our directory if you link to us.” Houzz essentially created a multi-billion dollar company by tricking designers and other home pros into giving them free links via widgets, fake awards (Best of Houzz, Influencer, etc), and blog “Stories” mentions. And, Houzz only provides redirected links back- possibly lesser than no-follow links in terms of value. This resulted in Houzz showing up at the top of local search results, bumping out the local home pros that used to be there. It was a coup. Now the home pros are at Houzz’ mercy, often needing to pay to advertise in their directory. Perhaps there is a correlation between this nofollow frenzy and the growing interest in “implied links”? Personally I feel like this is all part of a natural progression wherein guest post/outreach abuse>nofollow everything>shift to giving more weight to non-linked brand mentions/implied links. I mean, the internet is big right, so legit links will always be a factor, but maybe Googs can turn the dial up in the value of “implied links”. Also, I’m no tech Yoda, but could Google theoretically turn nofollows into like, “10%follows” or something? If nofollows could pass a small fraction of linking site authority, then maybe a more healthy natural nofollow/follow ratio of the web could be restored? I think big companies are making mistakes.and small businesses.and entrepreneur pay their price.Google monoply is helpful mostly to big giants. Individuals who dont have knowledge about seo should not be targeted.why.google is giving more value to https? Why an.individual should pax the price for https if there only intent is to share helpful.information. I think these policies should be revised with balanced approach. Glen as always great and insightful content. Before someone tries to ‘out’ me, I’m writing it in public here first. I’m going to nofollow every outbound link on one of my sites, and see what happens to my search traffic. appreciate you finding the time and effort to put this information together. Great post and very thought-provoking argument. Instead #fakelinks being the reference, maybe we should just call #linkbait ? An interesting thought that comes to mind as an affiliate marketer is all the dofollow links we send out to authority sites to look ‘natural’, What are you thoughts on rethinking this strategy based on your argument? Brilliant article, Glen. I never gave follow, nofollow attributes so much importance. Looks like I need to get into it. Thank you for these very interesting insights, Glen! I am just wondering if nofollow links really don’t work or pass a kind of linkjuice? Read therefore also experiment #10 on http://seosherpa.com/seo-experiments/. What’s your opinion or experience to this point? I can’t find the article but if I remember correctly, I heard it in a German Google hangout with John Müller, that nofollow links also consume linkjuice but don’t pass it further to the page, where they link to. In this way, link sculpting wouldn’t work at all. I am aware that we can’t believe to everything Google tells us. Bat what you think about that? However with some common sense, I think Google can’t and won’t ignore all the nofollow links on the internet in their rankings, because meanwhile they have an undoubted majority. Great article and very thought-provoking points. A couple points I think are worth mentioning…1. the PR page or testimonials, in general, can provide a lot of value outside of SEO for a company, so from that perspective, it’s kind of a win-win for both parties. One company gets more credibility from adding a review or “Featured In” logo to their landing page, and the other party gets the link juice. 2. If a company links out to an interview from their PR page, and they notice the interview link is a no follow, couldn’t they just make their link from the PR page a no follow as well? Then they just reap the benefits of the press coverage and are unaffected by the no follow. However, what’s your opinion that these links (90% of them) go to inner pages and not actually to homepages of the websites that do these press covers? Do you think they would have the same power as linking to the homepage? Have you seen any case when they get a contextual link to their homepage or a money page just in the case of websites do with edu links? Glen, it sounds like the epic “I told you so” “Google Falcon Update” (made that up from #fakelinks) that may still come. I had mixed emotions but one does feel hopeless but unless such sites gets boycotted or something we are only bystanders I guess. Hi Glen, I’m new to the SEO stuff and I must say that your articles are a little bit difficult to understand for people with no-perfect english skills, like me, nevertheless, the topics and the art you handle with is very impressive. Also this article! I found it very interesting and useful. Now as I said I don’t know all things about SEO and Co. But I know that (especially) big media companies are giving the opportunity of Press Releases, even for affiliate websites, provided the releases are written properly. They probably make even from this one business millions if not billions of dollar. I think that this issue (nofollow any kind of links) is related to the press releas business they conduct. Because if they wouldn’t do so, they would have drill a hole in their “fortress”. I’m not saying that I agree, but it’s a plausible explanation for me. Otherwise they would have opened a door for businesses and people knowing a lot of methods how to use media websites to receive strong backlinks for free or a little amount of money. Now this theory might be plausible for media companies but, there is still an issue if we consider that not all sites applying this “nofollow method” are media websites like you mentioned in your article. I am a beginner in this industry which we say digital marketing and I understand little-bit things who are measured in this article. I am a novice thinker. It means that nothing comes to me but I trying. I hope that Words of this article are helping me in future. Thanks for sharing a gratified information with me and whole people are related to it. Another great piece of content Glen. Thank you for bringing this growing problem into the light. Really great article and long overdue that someone could tackle this subject in-depth. The world of linkbuilding is in a strange place right now. Wow, this is a huge and very comprehensive article about link building strategies. It is obvious that an active media page will be a very source of link for a blog or an article. I used to comment on the large media websites and some of them allowed me to insert a related link from my blog and this way I got more coverage. Thank you for this Glen,it made me really pissed but at least we know.So many will never know.I hope there is something done about it,but hey…money is money,and Google is Google.Love your Blog by the way! There is a pretty long time to wait until the bots used by search engines will make a difference between a real link and a fake one and between good and useful content and the content created by some websites that rank high in searches, but they offer only a short article copy/pasted from the real sources. Thanks for the share. Glen as always great and insightful content. Very interesting discussion, but the press backlinks tactic is really good, especially for website who wants to rank with their homepage. Because most of the time, when you get a link, the link points to the homepage. I’ve never tried to “prove” it, but it’s a recurring theme in my work. Sites with quality nofollow links – and not much else – seem to do OK provided everything lines up in terms of quality, relevance, etc. That’s all I can say about this content. Got to learn a lot. Appreciate your effort in putting out this content. This is extremely helpful, i’m wondering for useful and effective one. u just describe the method in very simple way. Thanks for sharing this useful knowledge,Impressive writing. Join subscribers from companies like Amazon, IBM & Cisco. Copyright Detailed, 2019. Powered by NZT-48.